Troika Pottery was set up in 1963 by Benny Sirota, Leslie Illsley and Jan Thomson, with Jan Thomson being bought out in 1965. In 1963, Troika Pottery was set up in Wheal Dream near Porthgwidden beach in St Ives and this is now the St Ives Museum. Troika was based on the ground floor and originally took over the Powell and Wells Pottery. Benny Sirota had the potting experience and Leslie Illsley had trained as a sculptor. Leslie Illsley concentrated on the design of moulded pieces and Benny experimented with surface textures and glazes. This unique combination led to the development of the smooth glossy finishes and textured surfaces that Troika pottery is famous for. 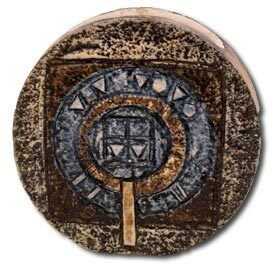 Initial Troika products were developed from the tile and doorknob blanks left over from the Wells pottery. But Leslie quickly developed master Troika moulds for teapots, coffee sets and mugs with floor and wall tiles coming along after. The Troika team approached and formed a good relationship with Heals of London and this provided steady orders until around 1978. Troika pottery moved to Fragden Place in Newlyn in 1970 and increased production. The partners purchased an old salting house in Fragden Place, Newlyn, which they renovated and produced a large working space which allowed them to increase production. Orders boomed and more staff were employed to deal with the increased workload. The Troika coffin vase was released and, just as now, proved very popular. In 1980, Benny Sirota left having taken a decreasing role in the business. In 1983, Leslie Illsey was forced to close the Troika pottery business having lost the Heals orders and due to ever declining sales in the late seventies and early eighties. Almost all Troika pottery was made in moulds, with most items having one basic mould. Textured pieces had moulds with several different designs and decorators were given the freedom to modify textured moulds providing principal colour combinations were used. The Troika Pottery to Collect – in relatively recent times any piece of Troika would command good prices at auction but the market fluctuates and you should concentrate your collecting efforts on the most popular shapes and artists.